Congratulations to the City of Koronadal and its partners and the participants in the successful Guinness World Record attempts held last April 29, 2017. In a Facebook post by City Mayor Peter B. Miguel last June 10, he happily announced that the City of Koronadal with Petron, National Federation of Motorcycle Clubs, Inc. and South Cotabato Motorcycle Club has officially been confirmed two (2) Guinness World Records. The records are for most motorcycle engines started simultaneously with 3,184 participants and the most motorcycles horns sounded simultaneously with 3,177. We are thrilled to inform you that your application for Most engines started simultaneously has been successful and you are now the Guinness World Records Title Holder! The most engines started simultaneously is 3,184 and was achieved by Peter Miguel, LGU-City of Koronadal, Petron, National Federation of Motorcycle Clubs, Inc. and South Cotabato Motorcycle Club (all Philippines) in Koronadal City, South Cotabato, Phillipines, on 29 April 2017. The record was attempted to promote motorcycle road safety. Your second record attempt has been approved as well. Congratulations on an amazing event, you are officially amazing. The most motorcycle horns sounded simultaneously is 3,177 and was achieved by Peter Miguel, LGU-City of Koronadal, Petron, National Federation of Motorcycle Clubs, Inc. and South Cotabato Motorcycle Club (all Philippines), at Koronadal City, South Cotabato, Phillipines, on 29 April 2017. At this point I would like to say it’s been a pleasure working with you and I wish you the best of luck with any future record attempts. For any other enquiries you may have my colleague Fay, cc’d here will be able to help. 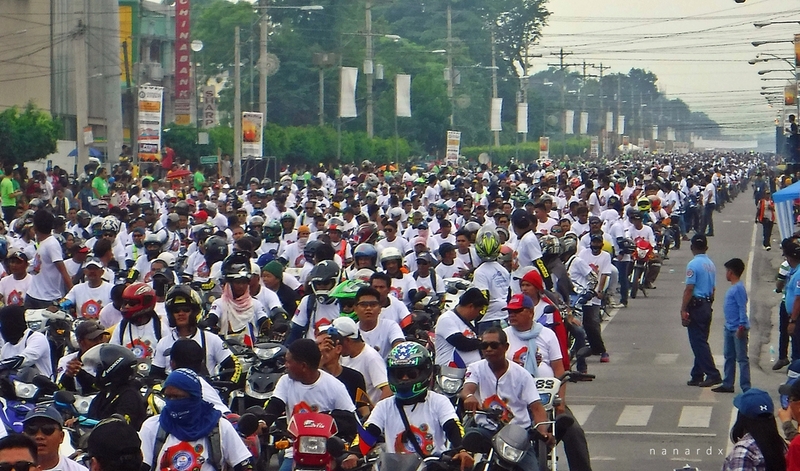 Koronadal City's world records attempt last April was the highlight of the city's hosting of the 23rd National Convention of the National Federation of Motorcycle Clubs of the Philippines and the Koronadal Motorcycle Festival.